The movie leaves off at the end of the series. Should I post it OR does everyone want to view it through the url? It wont be out in December unless Madman release it monthly like the U.S. is so don't get your hopes up. That picture isn't a spoiler, it's adorable. Riza Hawkeye is a goddess! Luv4winry says that Winry is definately in it and that kbz333's sisterly love got Akira112 to finally talk... YAY!! That's cool, but now there's another question that comes to mind... and that is how big is Winry's role in the movie?! Hey guys i also found this site which give a synopsis of the movie and some general character profiles. You'll have to bear with the grammar on the site, it wasn't originally in English!! The movie is 105 minutes. That's quite reasonable for a movie, most are only about 90 minutes. i'm drooling already at the prospect of just under 2hrs. Yeh that touched my heart too. It just proves how close Ed and Al are. It wasn't grey when I used it. yeah that's probably it XD Pura just gave me the wrong tape, insteado f the last FMA eps its got Home and Away and stuff on it! 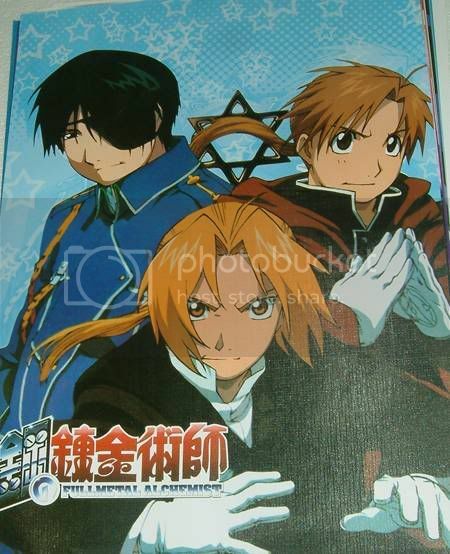 MUST SEE FMA!!!!!!!! where are you up to? insteado f the last FMA eps its got Home and Away and stuff on it! Armstrong: Proof? Your proof is right here! Look at this body! Flawlessly scupltured in service of our State! Feel how they pulse with loyalty, how solid and serious they are! Feel how! If you don't believe me, then they'll make you believe! Feel! If you search on wikipedia you can find some really good information about the movie i can't wait I'M SOOOOO EXCITED!!!! Hey there T.P. welcome abord!! Whoa how'd I miss all this movie information?! *gets excited* This is so awesome...I can't wait till the U.S. dubs it. And that pic of Ed & Al...so cute ^_^. Welcome to the boards T.P. Enjoy your stay! Yup, home and away was made in Oz, so don't laugh to hard welcome, T.P, check out the Introduce Yourself forums and get welcomed! kbz, I last watchefd ep. 40 the scar. Smae but somehow I remember that everythign in the end always ends well and everythign goes back to normal. The part how Hughs is a Nazi associate I fell over laughing about, that's just totally out of the blue! I read over the storyline bit, iit ruins the ending of series one FMA but I could sort of guesss what was going to happen anyway (I've only seen up to episode 30). Whitegreek that was obvious from the start of F.M.A. You see Ametris is actually Germany, plus remember that Hughes is part of Ametris military. Can you now put 2 and 2 together? akira, thats i thought to. only because of the way he is and the things he did do. but white greek you have to remember the hughes in the movie is from our plane, not eds', so he would be different to what you would think. and brother dear, just remember, whitegreek han't seen it all yet, so cut him a little slack, ok? I've also seen the whole series + movie with English subs.. i do think the movie couldve been a bit better.. but over all.. LOVED it.. and it will always be one of my favs. Hey kawaiitenshi, love your avatar, awesome!! 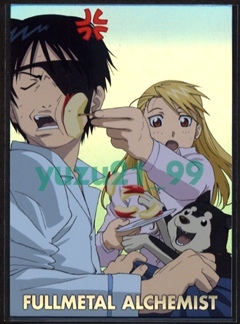 The Japanese DVD was released on January 25, 2006, including with it a limited edition with a special box, English subtitles and a series of other extras. Is wikipedia correct....or just the authors wishfull thinking? The authors are correct. The extremely limited edition has english subtitles. Wow....which i just found on yesaisa.com for a healthy sum of 123.21 australian dollars. Excuse me....i'm just gonna go sell a kidney. it's so totally worth it! Oh it's so worth it. The packaging is beyond gorgeous...I've only taken it out once for risk of fingerprints. There's an art booklet that comes with it too - very classy. drooling now. just need to find some money. damn it. gimme, gimme, gimme!!! Sorry, i don't have it. But my friend has it. He lended it to me. I must admit i love the packaging. And the extras are cool to. bugger, he /she wouldn't happen to be nice enough to let me lend it would they? She happens to be the girl i have a crush on. Ill ask her.